Our job as parents revolve around worrying about our children. While we cannot be with them throughout the day, there are ways to track their fitness. All you need is the best fitness tracker for kids. The market is flooded with hundreds of makes and models to choose from. Since we understand how overwhelming being a parent can be, allow us to make things a bit easier for you. In here, we will provide you with a detailed review of three of the best-rated trackers that are not only perfect for kids but easy on the pocket too. The three fitness trackers we have included comes loaded with all the features essential to track your child’s fitness. These trackers are perfectly sized and are budget-friendly too. Take a close look at each one to know which is the perfect choice for your little fitness buff. The Keyney Smartwatch is a classic fitness tracker that most of us have come across with. 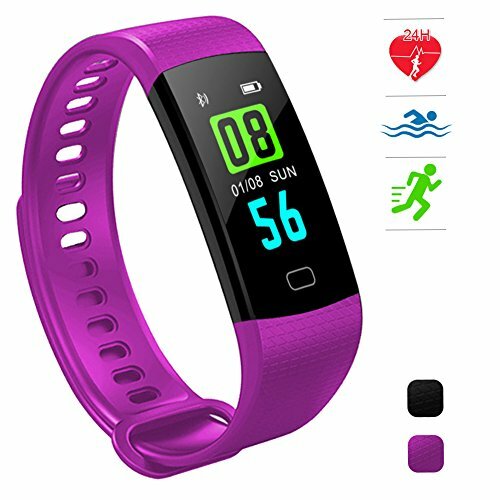 Available in blue, purple, and pink bands, this tracker gives sufficient color choices for everyone. 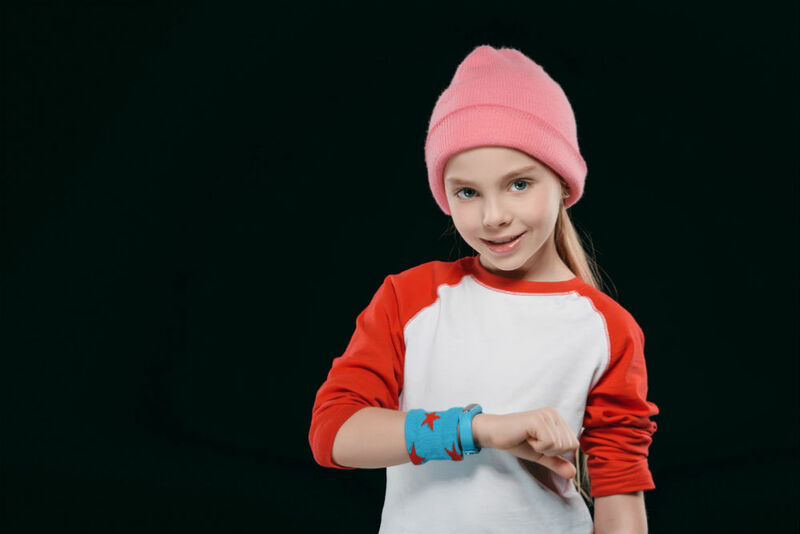 These bands come with an anti-lost strap that ensures it always stays firmly on your kid’s wrist. So, there’s never a worry of it getting misplaced. Moreover, these bands are replaceable too. You can buy each of those colors and wear them according to your kid’s outfit and mood. It has a 0.86-inch bright OLED HD display screen that shows your kid’s daily activity. It also boasts an IP67 waterproof level, making it safe to use in the shower or in the rains. Looking at its functionalities, there are quite a few, and they are both powerful and reliable. The tracker includes a calorie counter, a step pedometer, and a sleep monitor. This sleep tracker is fully automatic, and it will monitor and recognize your child’s complete sleep progress. It shows you when he falls into deep sleep, when he is in light sleep, and also record the exact number of hours he slept. This is great when you want to have an idea of your child’s sleeping pattern. Additionally, this tracker also allows the user to access his phone remotely by clicking images. At the same time, it also sends notifications on the phone, once you have synced the two. You need not worry about the tracker’s battery life either. This phenomenal product takes just about an hour to charge and offers you up to seven days of standby time. The tracker comes with a built-in USB plug, allowing you to charge it via a computer or a USB block. This eliminates the need for a dock or a charging cable. Lastly, the tracker features Bluetooth 4.0 and can support iPhones with iOS 7.1 and above as well as Android 4.4 and above. The HuaWise Fitness Tracker is a perfect all-day activity tracker that is loaded with several features but comes in a cute and small package. The tracker is available in black and purple bands, which can be replaced according to the preferences of the user. This screen is a 0.96-inch OLED display that emits a very bright light. It weighs just around 23 grams and comes equipped with an IP67 waterproof feature too. This fitness tracker, though small in size, comes loaded with a ton of other features too. For starters, it can very accurately record all the sports data as well as activities, such as steps taken, distance traveled, calories burnt, and several others. This is perfect, especially for a child, when you want to monitor that he or she is getting ample exercise in one day. This is also a perfect choice for an athletic kid, as there are 14 different sports modes programmed on it. In addition to those, you will also find a sleep monitor and a heart rate monitor. The sleep monitor is highly accurate and automatic. It completely monitors your sleep from the time you shut your eyes to the time you wake up and gives a detailed analysis of it. The heart rate monitor is very accurate as well. 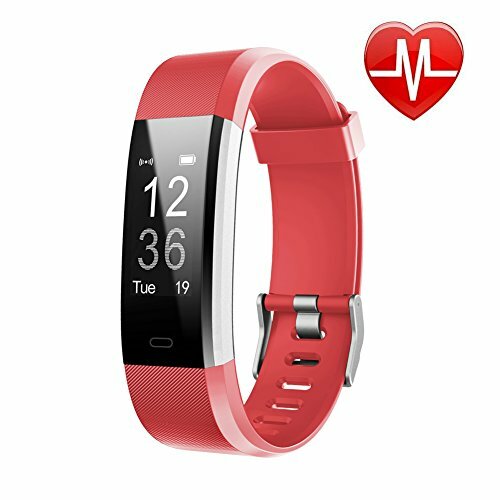 The fitness tracker comes with Bluetooth 4.0, allowing you to sync it with iPhones running on iOS 8 and above as well as Android 5.1 and above. Once synced, it alerts you with all the notifications that you receive on your phone, including your social media updates. Lastly, there is a built-in USB plug that you can use to charge it through your computer directly. It will take about two hours to charge fully and will offer up to seven days of standby time. The last tracker we are reviewing is the Letscom Fitness Tracker. This is a simple and sporty looking tracker that is available in five different colors, including red, blue, pink, green and black. It boasts a bright OLED 0.96-inch screen with a clock face that can be customized. It is extremely lightweight at about 24 grams and is waterproof and sweatproof too. The Letscom tracker features 14 sports modes, along with daily fitness tracking and an automatic sleep tracking function. 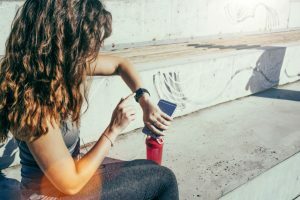 The upside on this tracker is that comes with GPS; it connects to your phone’s GPS to show you real-time stats of your run, right on your wrist. Moreover, it also has a highly intuitive heart rate monitor. 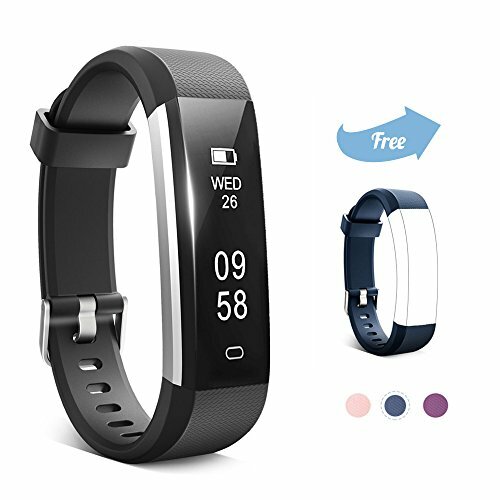 Other than these, this tracker can count all the calories burnt, distance traveled, and has something called a sedentary alert, which alerts you in case it notices that you have not performed an activity in a long time. This keeps you constantly motivated to move. The tracker comes with Bluetooth 4.0 and works with smartphones running on iOS 7.1 and above and Android 4.4 and above. However, it does not work with PCs, tablets, or iPads. Upon syncing the tracker with the phone, you can capture images from your phone camera remotely. Furthermore, all your phone notifications appear on the tracker as well. The best two features on this tracker are a silent alarm clock and wrist sense, which lights up the screen every time you turn the wrist towards you. Lastly, it has an inbuilt USB that you can charge the tracker with and will work for up to a week. So, which of the three is the best fitness tracker for kids? 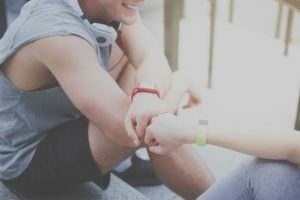 While they have certain similarities when it comes to their features, the obvious winner is the Letscom Fitness and Activity Tracker. This tiny tracker comes with a large screen and different colors, which is essential for children. It is also programmed with multiple sports modes, making it perfect for kids active in sports.